(MP136). Monochrome with body colour, signed.. The original of this magnificent Turner painting belongs to Captain Nicholas Wright CVO RN. Full of atmosphere and executed in dramatic style, the scene shows HM Yacht VICTORIA & ALBERT wearing the Standard of HM King George V, being greeted in impressive style by the Atlantic Fleet off Torbay on 4th July 1922. 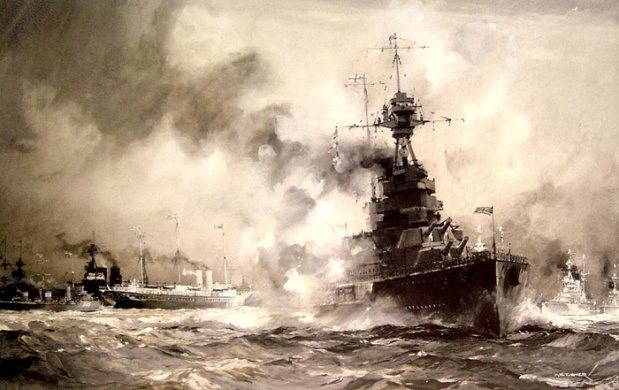 Flying his flag in the battleship HMS QUEEN ELIZABETH (Captain Geoffrey Blake DSO RN), the Commander-in-Chief Atlantic Fleet, Admiral Sir John de Robeck, Bt GCB GCVO, brought with him a strong team of ships. Astern of the flagship - who is manning and cheering ship as she races past His Majesty - are HMS ROYAL OAK, HMS RESOLUTION and HMS REVENGE; and over on the left are the Royal Escorts HMS WOOLSTON and HMS WIVERN whilst HMS BARHAM and HMS HOOD manoeuvre off the Yacht’s port quarter.